Parents who send their children to Lewis and Clark Montessori Charter School worry every day as cars blitz past during the morning commute. 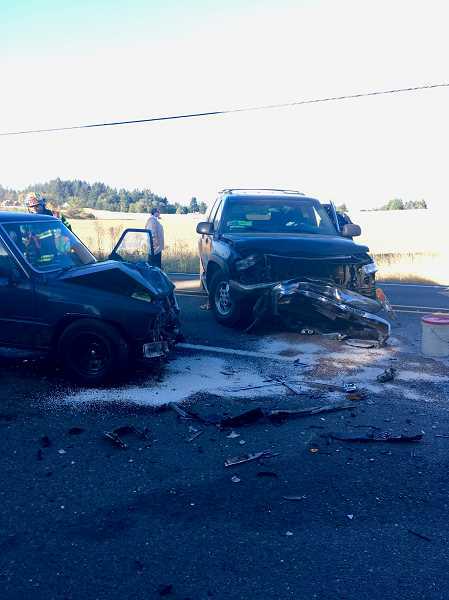 During drop-offs and pick-ups at the school along Southeast 232nd Drive just south of the Clackamas-Boring Highway, the situation becomes dangerous. Because of a small parking lot, parents waiting in the queue of cars often stretch into the roadway as they wait their turn. That results in drivers who are cruising along 232nd, notorious for its hills and blind spots, being surprised by the queue of stationary, children-filled cars. That combination, in addition to the lack of any obvious signage warning about the school traffic, often results in accidents, such as the pair that occurred Wednesday morning, Sept. 26. "We have been concerned about this situation for years," said Marion Freet, who is a parent at the school. "This was the first bad accident of the school year, but it won't be the last." The crash happened a little after 8 a.m. during the normal crush of drop-off traffic. As the line stretched to the edge of the road, a minivan stuffed with four kids was turning left into the parking lot. At the same time, a teenage girl came over the hill in an old pickup truck driving at normal speeds heading north. Because of the blind spot, she couldn't see the van until it was too late, and her truck plowed head-on into the car. "She was hurt pretty severely and had to be airlifted to (Oregon Health & Science University)," said Lewis and Clark Executive Director Courtney McWilliams. "Our families were all pretty shaken up." The family involved in the crash didn't suffer any major injuries, the school said, though it was terrifying for all involved. After the accident, teachers and parents jumped in to help direct traffic and get the students away from the wreck. One teacher who was on traffic duty during the accident said the teen was in immense pain and was calling out while being readied for Life Flight. Many parents said there was a lot of blood. According to McWilliams, it took Clackamas County Sheriff deputies about 30 minutes to arrive on scene. Once they got there, they blocked the roadway with a police cruiser to keep people away as they cleared the wreckage. That led to a second accident. A motorcyclist didn't see the parked police car and hit it as the rider came over the hill. According to the sheriff's office, it was not a fatal crash. "A lot of our students saw the accidents, it was pretty traumatic for them," McWilliams said. Lewis and Clark brought in counselors the next morning to make sure the staff and students who saw everything were doing OK. The almost 400 students who attend Lewis and Clark range in age from 3 to 15. "We have begged the county and Gresham-Barlow School District to put a light in or something," McWilliams said. The normal speed limit along 232nd is 45 mph, and even during school days there is only a suggested slowdown. Yellow warning signs, put in place about a year ago, caution drivers of the upcoming school about a quarter mile up the road in either direction, though the writing is in a small font indicating a 35 mph speed when children are present. Parents say it's not enough. 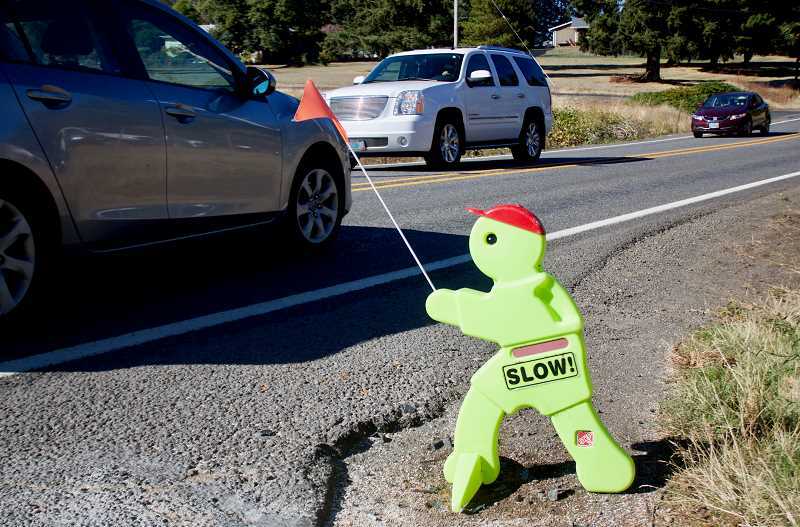 The situation in front of Lewis and Clark differs from other school zones, where flashing lights drop the speeds to 20 mph for which there is heavy enforcement. "We need to have some sort of notifications on both sides of the road as people are approaching the school," McWilliams said. "Speed is a huge factor, and what we have right now isn't enough." 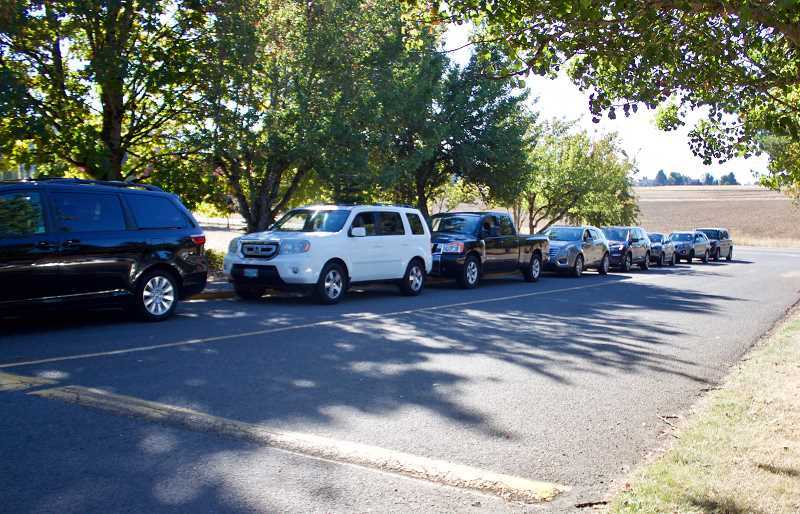 During pickup in the afternoon at Lewis and Clark, a large queue of cars forms all the way up to the edge of the roadway almost half an hour before the children are released. The school estimates that almost 90 percent of the student body are driven to school by parents or guardians, as the students come from a wide spread of districts. There are no sidewalks leading up to the school either, so walking is only an option for the bolder souls. At Lewis and Clark, teachers and parents are doing everything they can to keep their children safe. 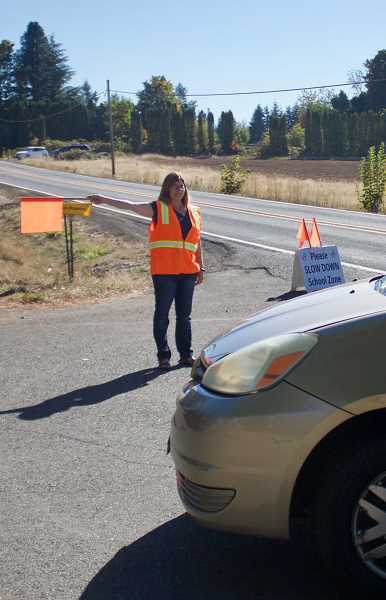 There are two plastic safety figures with orange caution flags marking the entrance to Lewis and Clark, and the educators moonlight as crossing guards and flaggers to keep things moving. The Gresham-Barlow School District, which oversees the school and rents the building to them, said it would be Clackamas County that has the power to change the signage around the school. The district said while it can't directly change things, it shares Lewis and Clark's desire to make things safer. "We fully support Lewis and Clark's efforts to get new signage on the road outside the school," said Athena Vadnais, director of community relations. "We are willing to attend meetings with the county or write letters of support — whatever it takes to protect the students." Until those meetings happen, and the changes can be made, parents said accidents will remain inevitable. "We all just want our kids to be safe," Freet said.